Established in 2008, we are a family run business based in Pontefract, West Yorkshire. We provide chair cover and equipment hire for weddings and events in and around the Yorkshire area. With many years experience in the Yorkshire wedding industry we know what's important - we pride ourselves on providing a trouble free, professional, friendly service for a reasonable competitive price. 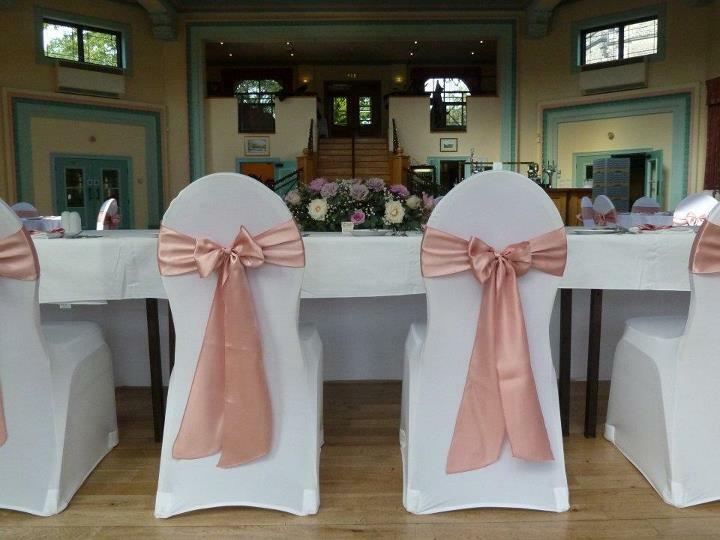 Our white stretch chair covers with satin, lace, taffeta or organza bows are just £3.00 each to hire including fitting or £1.25 without fitting. We also have a wide range of chair hoods available in lace or organza, chiffon ruffle hoods and chiffon drops. Please take a look around our website for more information about our products and services. Our social media pages are also regularly updated with photographs etc. If you have any questions I am only an email or phone call away. We cover the following areas in South, North and West Yorkshire . . . . Harrogate, Leeds, Sheffield, Barnsley, York, Selby, Wetherby, Halifax, Bradford, Dewsbury, Huddersfield, Wakefield, Pontefract, Doncaster, Rotherham, and many more! Please drop me a line to see if we can help with your event!